On a recent trip to Kansas City, we ate at Port Fonda and I had the most delicious roasted cauliflower tacos. I studied them. I inspected them. I devoured them. And then I did what I always do. I came home and tried to make an inspired version for all of you. Let’s do this! 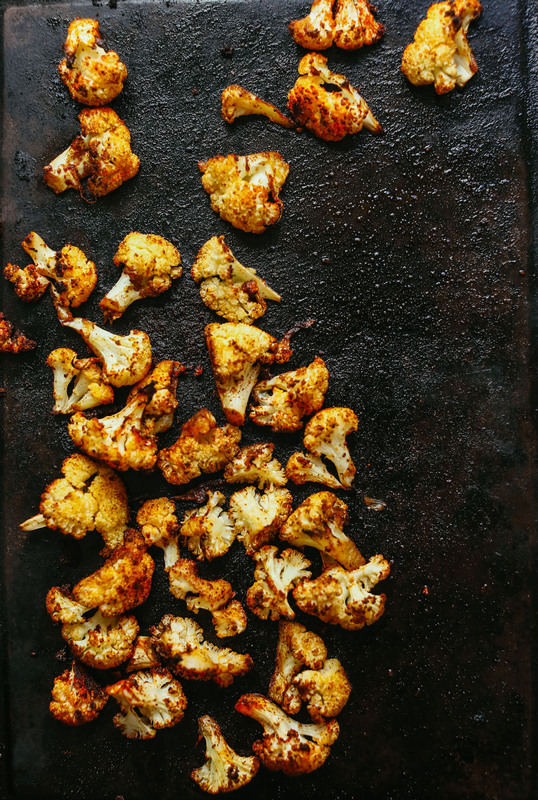 This is an easy, 30-minute recipe with smoky, roasted cauliflower and a spicy romesco-inspired sauce. It’s also plant-based, gluten-free, and oil-free optional and grain-free optional. I do a lot for you people! I must like you a lot (wink, wink). While the cauliflower is roasting, make your sauce, which is comprised of roasted almonds, roasted and fresh garlic, fire-roasted tomatoes, lime juice, spices, chipotle peppers, and a little maple syrup. 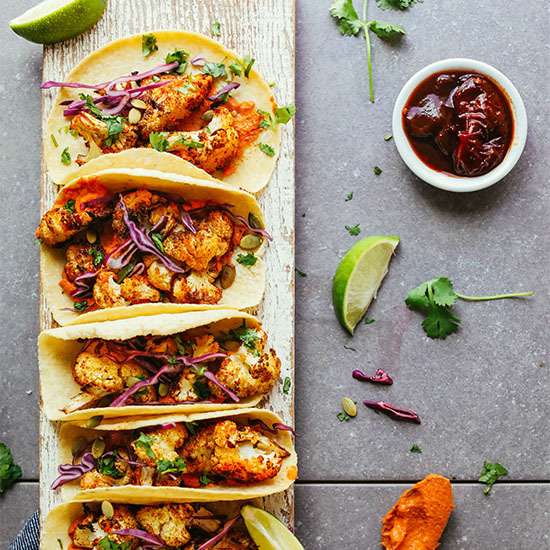 The result is a smoky, tangy, spicy, well-balanced sauce that’s thick and creamy and perfect for these cauliflower tacos. This would make the perfect healthy, satisfying weeknight meal when you don’t have much time to cook. The cauliflower could be roasted ahead of time and reheated in the oven or stovetop if you’re short on time. And the sauce lasts up to 1 week in the refrigerator, so it can also easily be made ahead of time to enjoy throughout the week. 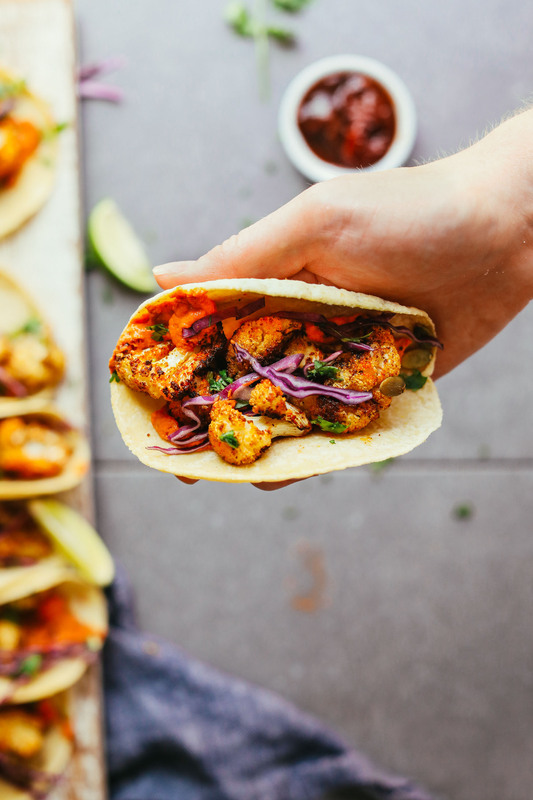 If you’re into Mexican-inspired meals, also be sure to check out our 5-Ingredient Ginger Beer Margaritas, Watermelon Margaritas, 1-Pot Vegan Barbacoa, Black Bean Butternut Squash Enchiladas, Mexican Quinoa Salad with Orange Lime Dressing, Quinoa Black Bean Salad Cups, Vegan Mexican 7-Layer Dip, Easy Red Salsa, Garlicky Guacamole with Plantain Chips, 3-Ingredient Plantain Tortillas, Roasted Jalapeño Vegan Queso, and Mexican Green Chili Veggie Burgers! *Note: quantity of cauliflower doubled on 10/09/2018. 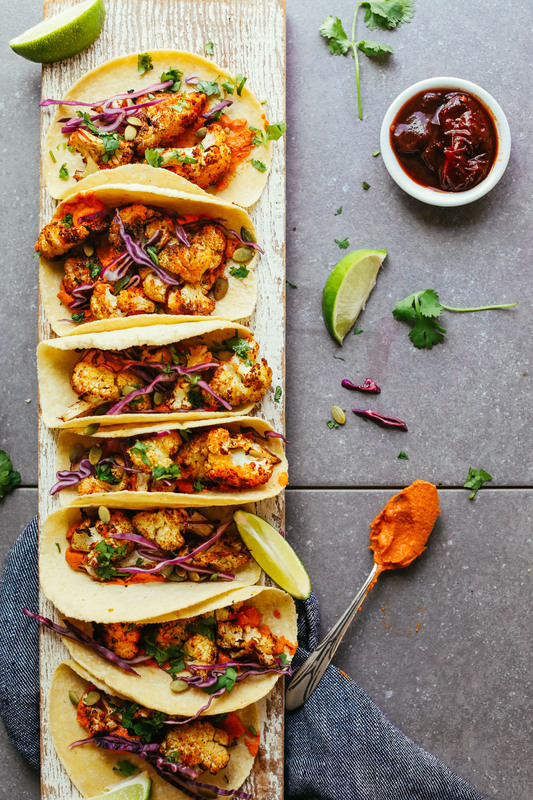 Smoky, roasted cauliflower tacos with a spicy chipotle romesco sauce! An easy (30 minutes!) and flavorful plant-based meal that's versatile, healthy, and so satisfying! Preheat oven to 400 degrees F (204 C) and add cauliflower to 2 large baking sheets (use more baking sheets if increasing batch size). Add oil (or omit/sub water), cumin, chili powder, paprika, and salt. Toss to combine and roast on the bottom rack for 20-25 minutes or until golden brown and tender. To a separate baking sheet, add raw almonds and the 4 unpeeled garlic cloves (amount as original recipe is written // adjust if altering batch size). Roast on the center rack for 10-12 minutes or until the almonds have started to brown/crack and the garlic is starting to get golden brown in color. Remove from oven and set aside. 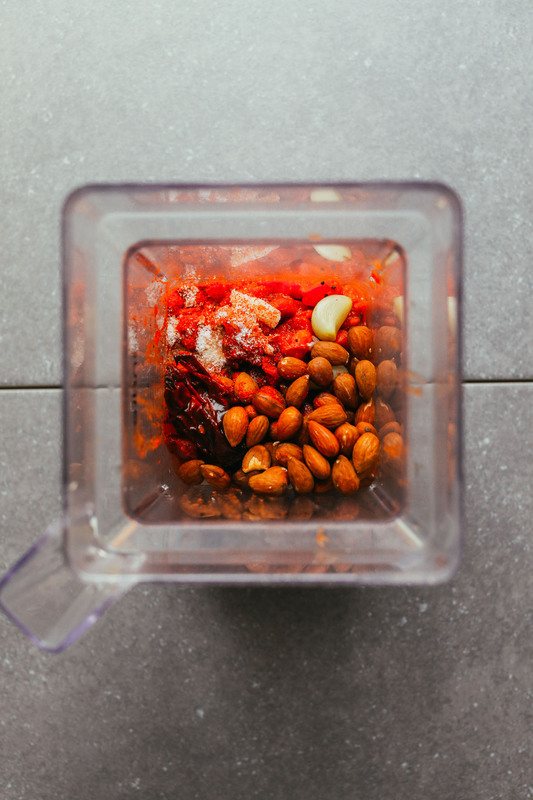 While cauliflower finishes roasting, add drained, fire-roasted tomatoes to a high-speed blender along with almonds, roasted garlic (peeled), raw garlic (peeled), oil (or water), lime juice, paprika, cumin, salt, maple syrup, and chipotle peppers in adobo sauce. Blend on high until creamy and smooth, scraping down sides as needed. Taste and adjust flavor as needed, adding more lime for acidity, garlic for kick/zing, salt for saltiness, paprika or cumin for smokiness, maple syrup to offset heat/add sweetness, or chipotle peppers for more heat. To serve, warm tortillas in the microwave or in the oven directly on the still-warm oven racks until pliable. Then add 1-2 Tbsp of the romesco sauce and a generous portion of cauliflower. Serve as is or garnish with lime juice/wedges, cilantro, cabbage, and/or pepitas (optional). Best when fresh. Store leftover sauce in the refrigerator up to 1 week (or 1 month in the freezer), and the cauliflower in the refrigerator up to 3 days. Reheat cauliflower in a 350-degree F (176 C) oven until warm (best when fresh). *Nutrition information is a rough estimate calculated without additional garnish (pepitas, herbs, etc.). *Prep time does not indicate total hands-on prep time, but also includes prep completed while other items are cooking. ← Announcing: The (NEW) Food Photography School! Made this last night and it was SO GOOD. My carnivore husband even loved it. We roasted zucchini and white beans along with the cauliflower and topped with avocado, cabbage and lime. I doubled the sauce recipe, so I’m excited to try it with other dishes. I live in the uk and can’t get fire roasted tomatoes, will a can of chopped tomatoes work? Or shall I add extra smoky spices? The cauliflower is roasting now and smells delish! We think that will work, Karen! We would say try it with the chopped tomatoes and then adjust as needed. Hope that helps! We would love to hear how it goes! This is the dreamiest and oh-so-easy! I tossed in some cumin spiced black beans to up the protein quotient and pit some sautéed garlic spinach over the sauce to get some greens in. I also didn’t have any whole almonds so used almond butter which worked perfectly. Thank you! I will make over and over! Omg I love this! I made it tonight with a couple of changes: I added chickpeas (spiced the same way as the cauliflower) to add some protein to the dish, some sour cream, cilantro and Mexican cheese blend and oh man… so fabulous. Thank you, Dana! Great work! After EVERYONE raved about them, my husband noted that we collectively sounded like the dogs when they are cleaning themselves. Essentially, it was a whole lot of smacking and slurping. Excellent recipe. No mods. Served with the pepitas, avocado, and cilantro (heavenly) on homemade keto tortillas which were also an AMAZING hit! Thank you… for helping me get my family out of a food rut and experimenting with absolute deliciousness! Hey, Dana! Love your recipes! Does the nutritional information listed here include the tortilla? Yes, it does! Hope that helps! I was having a hankering last night for Cauliflower Tacos and found this recipe and it is absolutely delicious! Oh! My! Gawd! These tacos are so damn delicious!! They will definitely be on regular rotation at my house. I didn’t have any almonds so I used cashews—and it was still a-damn-mazing! This is best recipe…. Have shared with everyone !! Sauce amazing … How else can we use the sauce ? It is super versatile and can be used in other Mexican dishes or even as a dip for cauliflower bites! Turned out great! I feel like it took a little longer to roast the cauliflower than the time stated though. I didn’t have any red cabbage so I sliced radish and onion to add for topping. I also chopped kale into tiny pieces for some added texture. I used 2 chipotle peppers in adobo sauce for the romesco and I was happy with the flavor. Had a kick but not too much for those that can’t handle the heat. Yay! Glad to hear that, Brittania! I love love love all of your recipes! your photos are just beautiful and inspire me to make the dish and the recipes are straightforward, actually work and don’t use too many over-complicated ingredients just for the sake of it. The only ingredient I find challenging to get (I live in Mumbai) and you use quite regularly is the chipotle chilies in adobo, as these kind of packaged products are hard to get or outrageously expensive. can you suggest a spice combo or some sort of substitute for me pls? Delicious, easy AND I was able to cook and eat it during my lunch hour. I subbed out the tortillas with portabella caps (roasted in the same spices). Even my VERY carnivorous boyfriend loved it and was completely satisfied without meat. This will definitely be added to our recipe rotation. Just started prepping. Excited to have this for dinner. Love all the ingredients, so I am sure this will be awesome. However, the 5 minute prep time is very inaccurate. Just chopping 2 heads of cauliflower takes at least 6 minutes, along with washing and drying time. Peeling 7 cloves of garlic (4 roasted, 3 raw) definitely adds even more time. Again, I am thrilled to make this and don’t mind the extra time it takes at all, but feel that the prep and cook times are very dramatically optimistic. Hello. I’ve been using the recipe for the Thai tacos. This is linked to this new recipe. Where can I find the original posting for Thai tacos? I LOVE it but don’t remember exactly how to make them. Help? Absolutely adore this recipe.. I could drink it. I do usually wind up adding more almonds — about 3/4 – 1 cup instead of 1/4 cup — for a thicker consistency. Thank you, Dana! DELISH! The cauliflower was very good, but the romesco? Amazing! I only baked the cauliflower for about 15 minutes because I like it a little firmer, and I increased the baking/roasting time for the garlic by three minutes. I also ended up only using three of the four roasted garlic cloves since two of the cloves were huge. I’ve already had two leftover tacos for lunch and it’s only 10:30 :) Thumbs up from my only-vegan-at-home husband, too! Whoop! We are so glad to hear that, Megan! I’m sure I’m not the first to say this: THAT ROMESCO SAUCE IS THE BOMB DOT COM. I was spooning it into my mouth before I even served dinner! Thank you for this wonderfully delicious recipe! I served ours with fresh flour tortillas from our local tex-mex restaurant, shredded radicchio and avocado. Holy flavorful. Omg. Wonderful ! I accidentally put double the amount of cumin and it was still awesome. I also added sour cream and a sprinkle of cheese. Made these tonight for #TacoTuesday. I am breastfeeding a peanut intolerant infant, so I substituted the almonds with sunflower seeds and the sauce was insanely delicious. Thank you for sharing this, Dana. Definitely another favourite in my house. This is my new favorite recipe of all time! I’ve generally viewed cauliflower as an unimpressive veggie… but the flavors are just so good. I followed the recipe exactly and had enough for four meals or so. Sometimes I’ll put the cauliflower and romesco on some black bean/corn salad or in a tortilla with a dollop of plain Greek yogurt and pumpkin seeds and cabbage. So good and now I need to get to the grocery store to buy another cauliflower! Yay! Thanks for the review, Alex! I had leftovers of your Chipotle Red Salsa so I blended it with jalapeno, almonds, and some spices and it made for the most perfect sauce for these tacos! Do you have any recommendations for protein sources to add to these tacos? Hi Sudeppti! You could add more pepitas, go heavy on the sauce (since it has almonds), smoky tempeh, or add some vegan barbacoa! Loved this recipe! It made a lot of Romesco sauce though and it was a little hard to get a smooth consistency since I don’t have a nice blender lol my mom was a big fan even though she seemed thoroughly repulsed by the idea of cauliflower tacos lol. They were such a hit the the left over cauliflower was just eaten alone because it’s that dang good! Would make again but double the recipe to have the tacos be overstuffed since they’re not very filling. Excellent -tasty , tasty. My only negative comment would be the serving size. Recipe says 12 tacos- I singlehandedly ate almost all of the food!! 3 corn tortillas filled with scrumptious ness….so good!!! These tacos are INCREDIBLE. Quite possibly the best homemade tacos I’ve ever had. Thank you!! We froze some of the sauce and plan on making these again this week. What would you recommend as a substitute for the garlic? My boyfriend is super sensitive to it and even 1 clove can affect him. Can he tolerate garlic-infused oil? If so, add some of that. If not, add sautéed shallot in its place. Thanks for the suggestions. I’m not sure about the garlic infused oil but I’m sure shallots would be ok! Made this tonight and it was a huge hit. The sauce is delicious and spicy. I served the tacos with a spoonful of pinto beans and a quick salsa made only of sweet onion, cilantro, jalapeño and lime juice. We will be making this recipe again. I’m also trying to come up with some ways to use that sauce…. Woot woot! Thanks for sharing, Naomi! I just made this 4 lunch and it was a hiiittttt!! The whole coliflower gone,i have a 12 & 9 yr old and was not a single leftover piece? I will definitely mark as one of my fave. OMG, OMG!! I made this Cauliflower tacos! They have become one of main got to dishes! My son, who generally does not like cauliflower, cannot get enough of these tacos! It is so, so yummy!!! And the chipotle sauce is heavenly. I make extra and freeze it for next time ;) Thank you for sharing!! This sauce was incredible!! My GF is allergic to almonds, so i subbed at a 1:1 ratio with roasted & salted shelled pistacchios from costco and it tastes delicious. Awesome! Thanks for sharing your sub, Scott! We love these tacos SO much that I am minimalizing : ) even more by making a large batch of the spices. So far, I have only mixed a large batch of the Cauliflower seasoning (everything including the oil that goes on the Cauliflower before roasting). One recipe of the cauliflower seasoning = 2 tablespoons. So you can make a big batch and then just shake your jar and measure out 2 tablespoons. Yum. Thank you!! Great idea, Tami! We are so glad you enjoy this recipe! This is one of my new favourite taco recipes :) The sauce is to die for! If you are making it for people with low spice-tolerance I recommend using only one chipotle pepper. Two definitely has kick! We topped it off with fresh mango, some pre-packaged slaw, avocado, and bean salsa. The cauliflower was so yummy I’ve just been snacking on the leftovers! I want to use the sauce as a base for pizza sometime, I think it’d be really interesting. Thanks for the great recipe! This recipe is awesome! It was so simple to make and resulted in a delicious meal! Thank you for sharing! Hi Dana! I love your Thai tacos with ginger slaw and peanut sauce, but when I click the link from Google or Pinterest board, it takes me here to the cauliflower recipe – do you still have the Thai version?? Thank you, thank you, thank you!!! I made this recipe tonight and it was amazing!!! The only thing I changed was to add roasted sweet potato. This is a keeper!!! Been on a roasted vegetable kick lately, and I stumbled upon this recipe. Really liked the spice on the cauliflower, especially in combination with the coconut oil. Made a broccoli slaw with lime and cilantro as a topping which added crunch and brightness. Delicious and filling! However, the hands-down star of the dish is the sauce! I made it as directed, but with only one chili, and it came out perfectly, with medium heat. I’ve used the leftover sauce in a panini and as a salsa-esque dip. Worth making on it’s own. Woot woot! Glad you enjoyed it, Mark! I haven’t even tried the tacos yet (they’ll be dinner later tonight), but had to leave the kitchen so I would stop snacking on cauliflower pieces dipped in the romesco….SO BOMB. Never disappointed with any of the recipes. Thank you for making my adventure in cooking new recipes a joy…. Absolutely LOVE this recipe! Quick, easy, healthy, and delicious. We double the cauliflower for our family of 4 so that we have leftovers for lunch. Delicious, easy, and quick! I went with 2 chipotles but I think I’ll do just one next time. The sauce was so tasty that I wanted more, but my mouth couldn’t take more spice! Served this with a side of rice for dinner. These were amazing. All those wonderful flavors exploding in your mouth at once is wonderful. I added more peppers because I like mine with a little heat. I will definitely make these again and hopefully I will have cilantro this time to add with the cabbage. Thank you! I made this for lunch today. So easy and absolutely delicious!!! I didn’t change a thing in the recipe. any chance we can have the Thai Shrimp Tacos and ginger slaw re-added. The pinterest link takes me to this recipe now and I can no longer find that recipe on the site. This is AMAZING! We had this for dinner tonight. This reminds me of the perfect vegan version of a “shrimp” taco. My husband and I live on your recipes. Thank you so much for sharing your incredible talent! This was seriously so delicious, I looooove the sauce. I pit a whole can of Chipotle in adobo because I like spicy and it was awesome! Thank you so much for my new favorite recipe! I made this.. it’s amazing! Just became vegan.. this taste like a street vendor taco ! I live in San Antonio,Tx. .. so glad I found your site!! I absolutely love this one. I’ve made it many times now. It’s a go to one for sure! thank you!!!! I loved these tacos! I roasted the cauliflower in my Traeger for extra smoke..so good! Fantastic! Will make these again and again! I just ate this and I’m speechless! Absolutely amazing! Thanks so much for a fab recipe. Hey! I’m sorry if this question has been asked a million times but what could I use in place of fire roasted tomatoes… I’m not sure I’ve seen them kicking around my local stores here in NS, Canada. Maybe there is another name? Maybe I just haven’t noticed. Thanks! I’m also from NS so I know your struggle haha :) I didn’t have fire roasted tomatoes either so I just used a can of tomato sauce. It came out great! Wow this was so good!! To be honest I was surprised because I was a little skeptical, seemed like a lot of spices on the cauliflower and odd flavor combo, but I followed the recipe exactly, and it was fantastic! And for reference I’m brand new to vegan/ plant based eating, and even my reluctant vegetable eater husband enjoyed these. I also served them with avocado slices and green cabbage instead of red. The sauce is especially delicious. Definitely keeping this recipe. Just made this for dinner…so good! Loads of flavor and very satisfying. I added purple cabbage, cilantro and green onions into the tacos. Will definitely make these again! I’m not a great fan of cauliflower but had some in the fridge, and decided to try this recipe – I was pleasantly surprised! Really tasted great, and is very easy to make. I added some spring onion, charred green pepper thinly sliced as well as thinly sliced radishes. I also used the leftover sauce over fresh pasta the next day, also good! Made this tonight (doubled for the four of us) and it was ambrosial. Served it with tofutti vegan sour cream, chopped cilantro, sautéed peppers + onions, and shredded red cabbage as garnishes. I was planning on leftovers, but there were none! I am new to Vegan eating and have been searching all over the internet for recipes. I tried this and it is great! Everything that I have tried from this author has been just wonderful. Wow, these were really good, but that sauce!!! OMG! I forgot to drain the tomatoes so the sauce was thinner than the picture. It still worked for the tacos, tasted absolutely amazing, and I am going to try it as a pasta sauce. So. Good. LOVED these! This recipe is definitely a keeper. It did take about an hour to prep and make. The flavors are perfect together and the cauliflower is hearty. I added raw sliced tomatoes and onion as well as romaine lettuce to the tortillas. I can’t wait to make them again. My husband and I made this tonight and it was amazing. I never honestly made something solely vegan or vegetarian and this was sooo good!! I even made the the plantain tortillas and that turned out great! Thank you for this and I look forward to making more of your receipes :) the only sub I had was I used cashews instead of almonds since that’s all I had. I have made the chipotle romesco sauce from this recipe every single week for the past couple of months. It is now a household staple, delivering great flavor to a variety of different meals. Thanks so much for creating it! I made these tacos for a girl’s night and it was a huge hit. The only modifications I made were that for the sauce I omitted the maple syrup, used lemon instead of lime (because I forgot a lime- whoops), and I did 1.5x the amount of roasted garlic. For the toppings we used cilantro and scallion which I think rounded out the flavors nicely. We had a kale salad on the side which had mango, red onion, and black beans with a citrus dressing. I think because the tacos are protein-light but still filling, having the black beans in the salad rounded out the meal nicely. We also had guacamole because we’re Californias and we’re avocado addicts. The recipe left me with more sauce than we could use with the tacos but kept nicely in the fridge and I used it for a lentil and veggie bowl the following day. I was a little intimidated by the chipotle peppers in adobo sauce. It turns out, Goya makes them and they were easy to find in the Hispanic food section of my local Safeway. The comments here led me to believe the dish would be much spicier than it was! I’m glad I wasn’t afraid of the peppers, because I used two peppers the spice level was perfect. Also, I was tempted when I made this recipe to just use roasted almonds instead of roasting my own raw almonds but having them fresh roasted was amazing! I have made this a few times now for family and friends (all of them non-vegetarians and plenty of them cauliflower-haters) and it is always a huge hit with an embarrassing amount of compliments. This and your 1-pot shakshuka are recipes I always pull out to please anyone sceptical of meat-less meals; thank you! So glad it is a hit, Aimee! All the WOWS!!! This is FANTASTIC! I made it this evening, bit into it and swooned! My boyfriend and I just loved this recipe! Thank you so much. I have lots of sauce left and and am wildly in love with it, so I am going to use it on lots of things. One thing being roasted Brussel sprouts. I even think it would work on a vegan hot dog. Brilliant. We love these tacos so much- they are a regular in our house! Easy to make, economical recipe, and very tasty! Yay! Glad they’re a hit! Made this tonight for dinner for myself and my dad and we somewhat altered it (no precious measurements, replaced certain things with what was available) but nevertheless, I think this was probably the best homemade dinner I’ve made ever! will definitely be making again!! This is a fantastic recipe beautiful one. Oh WOW this was insanely good, my whole family loved it. This recipe is SO good! The sauce is amazing! I want to slather it on everything. Your taste is spot on. Thank you so much for your tasty recipes. All of my favorite vegan dishes are from you! This recipe is so mind blowingly good. I was told “You WILL be making this for me again”again by my boyfriend as soon as he swallowed the first bite, he was so in love with the flavours. In fact I’m making it again this week. When I first made this recipe served mine with a side of grilled red pepper and red onion together with a side of vegan friendly Mexican inspired cabbage slaw for a few extra veggies. You’re the best Dana! Hi Cody! You could try sunflower or hemp seeds! Thank you so much for sharing this recipe! I’m brand new at trying a vegan diet and this is the first recipe I’ve tried from your wonderful website. It also might just be the most delicious meal I’ve ever made. I added a little baby arugula, some red cabbage, and some sliced avocado. Amazing! These tacos are so tasty that I think I can finally break up with meat! The romesco is fantastic – hearty, earthy, smoky (the chipotle!) and I just want to smother it on everything. I used only one chipotle pepper because it lends just enough heat so that it doesn’t overpower the other flavors. What stood out was the flavor of both the raw and roasted garlic, and the mouth-feel of the cabbage crunch! The only addition I made to an otherwise perfect recipe, was the addition of a chopped onion to roast along with the cauliflower. I was so impressed that I made this two nights in a row. This will be a weekly-repeat. Just made for dinner and it is amAzing!!!!! Saving the leftover sauce and making it again tomorrow. Loved this recipe – the spices on the cauliflower bring out such great flavors. I also added roasted sweet potato! One question – I made the romesco sauce pretty exactly by the recipe, but mine came out pretty watery. Is there a way to thicken it, or any idea why mine did not come out like a thick paste? My (meat loving) husband and I made these today and they were a hit! We loved the sauce, and I cannot wait to use it on pretty much everything. We enjoyed these tacos topped with cilantro and chopped red onions with a side of guacamole. Hands down the best vegan tacos I have ever had!! The chipotle romesco is to die for and if you have left over sauce it’s great a great dip for corn chips ! 10/10 recipe!! This was an awesome recipe! Super easy and super yummy! It was a perfect dinner and very filling. Made the roasted cauliflower tacos this evening for dinner – fantastic! Had to substitute some of the ingredients I don’t have here in rural France – half a tin of tomato purée instead of a tin of fire-roasted tomatoes and five ground birds’-eye chilis instead of the chipotle peppers. This gave a sauce that was too thick, so thinned with about half a tin of water. I hardly ever cook, so was surprised by how quick and easy this recipe is. Served with green salad in homemade dressing (walnut oil, lemon juice, honey, garlic), lime wedges and chunks of ripe tomato. This is the first recipe I’ve tried from Minimalist Baker and it was a huge hit!! Ten out of ten, family favorite for sure. Made this to go with https://minimalistbaker.com/roasted-jalapeno-vegan-queso-7-ingredients/ the entire combo was a hit with everyone. Dana! Another win! I made this recipe tonight and basically ate the sauce out of the blender. I used some garden tomatoes that I broiled and a whole jalapeño because I didn’t have chipotle peppers. It was amazing! Thanks to all the other reviewers who wrote about how great this dish is. You convinced me to make it. So happy I did. OMG! These are, hands down, the best tacos I’ve ever had. First of all, the cauliflower is ridiculous. You could make that all by itself as a snack. But when you pair it with the chipotle romesco sauce…holy moly! So good! I didn’t have red cabbage so used arugula instead and it was super tasty. I can’t wait to make this recipe again. Made these tonight and followed the recipe exactly. Let me just say, THEY WERE AMAZING!!!! They were devoured! Served with shredded cabbage and sliced avocado. Had a lot of sauce left over (no complaints!) so will be making them again for this coming Taco Tuesday…except this time doubling the cauliflower in hopes of having more for lunch one day next week ? Your recipes NEVER let me down! Ideas for using up leftover sauce? It was so delicious-I want to use it all up! So delicious! We gobbled them all up and wanted more! Delicious! I used only 1 pepper to decrease the level of spice. Another great recipe! Especially enjoyed the romanesco sauce! This recipe was ridiculously great. The sauce was to die for! Perfectly flavorful and not overly spicy as written, tonight’s dinner was one of the best new recipes I’ve tried in some time. We had both corn and flour tortillas, and I have to say I preferred the flour over the corn, hands down. The romanesco is honestly the best version of this sauce I’ve ever had (and not just because I don’t like bell peppers)! Excellent + convenient/easy recipe! I made this for the first time tonight and they were delicious! My carnivore husband asked when he could have these again and ate two helpings. These were amazing; if you’re on the fence about trying them, hop off and run to buy cauliflower! Loved this recipe. Made it today. Sometimes ingredients are difficult to get in the Netherlands (like chipotle in adobe sauce) so had to wing it in some parts. Luckily I had plenty of smoked chili powder and smoked paprika but it was delicious. Thanks again for inspiring to eat healthy and supertasty. I love your website / blog. It’s so pretty and informative. Thank you! I began my journey and lifestyle transition to plant-based diet about 6 weeks ago. It’s been wonderful, I’m so grateful, I feel so much better about myself, life, and my role in honoring Mother Nature / God. I had some anxiety about actually starting to cook. I’ve been mostly eating out (alot of Gusto! (awesome restaurant in Atlanta, I get the half and half wrap with mushrooms), smoothies, veggie sushi rolls, and guacamole and chips). I decided to start my vegan cooking with this recipe… in fact I made this about an hour ago– they were delicious! I cannot wait to share with my sister and mom. I substituted the corn tortilla for whole wheat pita bread (with pockets, I got them from Trader Joes). I also made some brown jasmine rice. I put the rice on first. Once I finished with everything I cut a small slit in the pita bread and filled it with brown jasmine rice, sauce, cauliflower, then the salad. Omg — yesssss. Very filling and lots more left to share. PS – Do you offer a list of budget friendly recipes? I know your main focus is easy, one-bowl, under 30 minutes recipes which is so so amazing in and of itself. Hi Dana, I made this last night– it was great. Thank you for sharing the recipe. I have recently become a vegan and your recipes have made the transition so much easier. Your cookbook has been really indispensable, too! Any grand ideas for leftover romesco? We halved the recipe but I made the whole recipe of the sauce since I had the open can of tomatoes. On tacos or burrito bowls is pretty obv but I didn’t know if you or your readers had found a perfect way to use it up. Hi Kimberly! The sauce can be stored in the refrigerator up to 1 week, or 1 month in the freezer, that way you can have it for next time! Oh now I see that suggestion was was in the recipe! Thank you I don’t know why it never occurs to me to freeze things! My husband and I made this for dinner last week! We loved this meal so much! We ended up with a lot of leftover romesco sauce (not entirely a bad thing, may have had a smaller cauliflower or just sauced them more lightly) and are going to remake this recipe for dinner this week to use it up! Love your recipes. Made this for dinner tonight and my 6-year-old said, “mama I don’t just like this dinner, I love it! You’re the best cook ever.” So I’d say it was a hit. The whole family loved it – and I left out the chipotles because my 6-year-old is not a fan of spicy food and it was delicious. Thanks for another winner recipe! Wow! Made these tacos tonight and they were a hit with my meat-lover husband and nine year old. They both went light on the sauce (I made it a tad too spicy) so I have a ton left over. Plan to roast more cauliflower mid-week. Any more suggestions for using up the sauce? My husband went nuts for these. The romanesco sauce was amazing – my seven year old made it in the Vitamix! Your recipes are the bright spot to our family dinners. Yum! oops I forgot the stars ! This was so delicious we will definitely make it over and over. Thank you! Wow!!! I could not find a decent head of cauliflower because I live in Japan and this must not be the season for cauliflower. I tried 3 Japanese grocery stores and the military commissary. So I improvised and used a butternut squash. It was amazing. The chipotle romanesco sauce was to die for and the smoky paprika on the squash was out of this world. My husband and I both ate 4!!! Thank you so much for all your great recipes. I ordered your book today!! Hi Dana! I love your recipes, and plan to make this soon. Just a question: what’s the purpose of the almonds? I don’t plan to leave them out, just curious! The tacos are great but the sauce is spectacular!!! I want to put it on everything. Made a bowl of black beans, red peppers and cauliflower rice….covered with the sauce, so tasty! Although I’m sure Dana’s brain would come up with something even better. Can’t wait to share this taste sensation. I’m from KC, but have yet to make it to Port Fonda and definitely want to go now! These tacos were amazing. We recently went vegan and my husband raved about these. Recipe makes a ton of sauce and was a little too spicy for the kids, but they ate the cauliflower and I’ll freeze the sauce to eat later this month. Thanks! We’ve made this recipe twice now, and it is DELICIOUS! The sauce is so flavorful, and you can adjust how spicy it is by adding or subtracting the number of chilies (we did 2 the first time, and 4 the second—it was at least medium-hot level the second). The cauliflower is quick to prepare and the entire meal can easily be put together in under 30 minutes. I second another comment that said the sauce could be used as a dip, it could also be great over roasted veggies. I have a really tough time finding raw almonds for recipes… could I by chance use roasted almonds with a similar result? Made this tonight and turned out great! I made the sauce with 1/4 tsp of chipotle powder (in lieu of the chipotle peppers) and 2 Tbs maple syrup and the heat was just right. Will have a bunch of extra to use during the week. I served this with vegetarian refried beans and sprouted rice. This made 6 tacos instead of 12 for me (will have enough cauliflower for 2 leftover tacos). I am a runner and my partner has a physical job…just something others may want to factor in. I’ll probably make it with two heads of cauliflower next time. Love your recipes!! Oh man. I made the tacos earlier this week and they were a bit hit! I wasn’t sure my hubby would find them filling enough, so I threw some chickpeas in with the roasted cauliflower (roasted on the same tray) and by worked great. I also had some leftover sauce, so tonight I used it in place of regular pizza sauce as part of our regular pizza night and WOW was it amazing!! Next time I make this (and there will definitely be a next time) I’m doubling the sauce recipe so I can freeze more for pizza. Just made this and it was fantastic! Do you have any recommendations of what to do with the leftover sauce? Made this tonight and it was a hit! People were even dipping chips in the romesco sauce! I doubled the cauliflower and spices for roasting it after I saw how much sauce I had. There is still some romesco left over to freeze too. Thanks for another great recipe. Just made this for dinner and it was a hit with the family! My dad and brother are very carnivorous and both of them scarfed them down. Only thing is that it makes a TON of sauce, but I guess that is just a good excuse for more tacos. making the sauce looks so difficult. I wish there were links to each of the items you use so I can buy them from places because I don’t know where to find some of them in the store. This looks so good!!!! The sauce isn’t too bad, the two big parts are the nut/garlic roasting (just throw them in on a sheet then take them out 10 minutes later) and then just combining ingredients in the blender. I found the chilies in adobo in the Mexican section of my store and the tomatoes in the pasta/tomato sauce section. The romesco sauce is excellent (I used 4 peppers because I like spicy)! I put the cauliflower and sauce on greens and added crispy chickpeas. Delicious, easy dinner! Made this into a burrito bowl of sorts – layered romaine, quinoa, black beans, sauteed mushrooms/peppers/onions, the cauliflower and tons of sauce (minus the maple syrup). INCREDIBLE. Love all your recipes Dana! These came out AMAZING! I have an almond allergy so I subbed pepitas for the romesco sauce and loved the results. Perfect blend of sweet, smoky, a little heat and nice crunch (I used cabbage and roasted pepitas to garnish). Can’t wait to have leftovers! OMG!!! I went vegetarian on July 30 and it has been VERY difficult. So sick of salads. I made this tonight and ate like a pig! I thank you and my tummy especially thanks you. I have enjoyed eating again! Easy trip to flavortown! The sauce got a little “soupy” mostly because I used all the Roma tomatoes I picked the other day from the garden, which was around 500 grams. So, the left over sauce will be tomorrow’s Fire Roasted Tomato Garlic Almond Lime soup. haha yes! This sauce is AMAZING! Spicy, rich, tangy. Romesco + steamed veggies is my new guilt-free snack! A garlic clove exploded in my oven. Should I have cut the end off, as you do when roasting a whole head? I just threw them in as is. I really enjoyed this recipe. I don’t care for it much as a taco, but really loved it as sandwich filling. I chopped the roasted cauliflower up very small and mixed it with the sauce to eat on toasted gluten free bread. It turned out really savory and delicious. I’m definitely adding this to my recipe stash. Looks delicious! Cannot wait to try the roasted cauliflower! Made this tonight and we score it 10/10 Absolutely amazing. We substituted tomato with roasted red peppers. And made fresh guacamole and added it in the taco. Delicious. Next time I will do two heads of cauliflower because we have so much cheese left over. I made this for dinner last night. It was the first of your recipes that I have tried. We recently switched to a plant based way of eating and we were struggling to come up with some new ideas. My husband loved this recipe and so did my children (amazing in itself!). I feel so inspired (I am headed out to pick up your book tonight). Thank you for putting your time into these recipes. I can’t wait to try some more! I made this and it was sooooo good! The chipotle romesco sauce was absolutely delicious. Friends who dined with us loved it. One friend who was not a cauliflower fan especially liked it. Thank you, Dana, for my new go-to taco dish! So delicious we made it for dinner two nights in a row! Thank you for another fantastic recipe! Holy deliciousness! Followed the recipe exactly, with some extra garlic and twice as much chipotles. These might be the best tacos we’ve ever had! Thank you so much!! Delicious! The spices and flavors were perfect. I topped my tacos with red cabbage, cilantro, extra lime juice, and queso fresco cheese. Yum! Yum! Yum! And did I neglect to say Yum!?! We are so happy to have leftovers since these are incredibly delicious. Made it exactly as you suggested, just with tostadas since we find it easier to put stuff on a flat circle than a folded up one. The cauliflower is delicious. The colors are so pretty, with the red/purple cabbage and green of the pepitas and cilantro. But what really makes it is the Romesco sauce. There’s got to be some other ways to use this stuff. Over pasta? Sweet potatoes? Chickpeas? A local restaurant just opened and does have some vegan tacos on the menu, like cauliflower and portabella. While I’d like to support them in their vegan efforts, there is no way I could be satisfied eating some lackluster restaurant version after having had yours! Smart! Glad you enjoyed it, too! I have so much sauce left! Anything else you recommend using it with/on? Other tacos or Mexican dishes, or with tofu scrambles or roasted vegetables! Can the sauce be made nut-free? Will it make same result? Made these tonight for hubby and I for dinner. Amazing! Seriously one of the best meals I’ve ever made! Hubby can’t stop raving about them! Seriously restaurant quality meal! Yum! YUM! 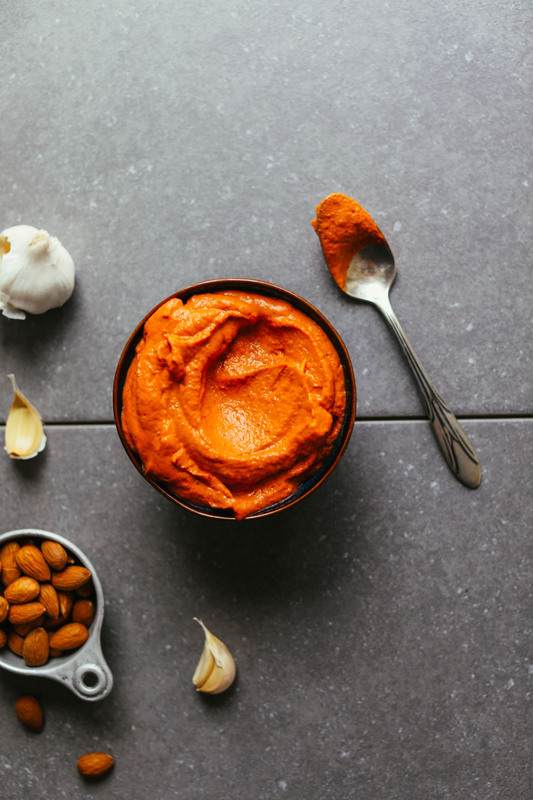 I had no idea romesco sauce could be so good. this dish was extremely easy to make and delicious as well. roasted some chickpeas too for extra protein. just wanted to say Dana that I have completed relied on your recipes these last few years and it has cultivated in me a deep love of cooking and baking. just wanted to thank you for so many delicious recipes, and for making recipes that seem difficult (homemade sauce or yogurt, for example) extremely easy and delicious! that chipotle sauce! holy yum! I made this last night and my husband and i loved it. having leftovers for lunch today and made it into a cold wrap. So good, ate it tonight and I to say it is changing the way I think about cauliflower. Thanks! I made this tonight and it was OUT OF THIS WORLD DELICIOUS! Thank you for such fantastic recipes!! I made it tonight for our family. I had to make some substitutions for the smoky, spicy sauce. I used fresh tomatoes, added some diced avocado and chipolte powder in place of the whole peppers. So much flavor! The kids ate the tacos with lettuce and no sauce and I added black beans too! Fabulous recipe! Made this for lunch today. Everyone loved it. Had everything I needed except corn tortillas, so I used whole wheat pita instead. I just made these and they are delicious. I used a can of Muir Glen diced tomatoes with chipotle and omitted the chipotle in adobo and it’s plenty spicy! The sauce recipe makes a ton so I’m trying to think of how to use it up. Definitely freezing some! I made this last night. The sauce is AMAZING and the cauliflower spicing was just as you described! I added some grilled onions and peppers which was really tasty. I will definitely be making this again. Thanks for the great recipe ? Would love to try this! Do you have a favorite store bought tortilla? I have not liked the ones I’ve tried so far. Hi Krithika! We don’t have a favorite store bought tortilla but you can check out our homemade tortilla recipe here! This was great! I altered the recipe a bit due to what I had, but the spice combinations were spot on! I ended up using fresh tomatoes (too many available right now to be using canned tomatoes! ), and a mixture of cashews and sunflower seeds in place of the almonds. Perfection. I had a cauliflower taco last weekend at the Taco Festival in Detroit, and wanted to recreate it for my son’s birthday dinner. Thank you for the perfect timing!!!! I’m going to try omitting the almonds for a thinner sauce. Those fire-roasted tomatoes aren’t sold here. Can I replace it with something else? Sundried tomatoes? Hi! It will change the flavor a bit but you can replace it! I just used regular canned tomatoes and added a bunch more smoked paprika. Could I possibly omit the almonds for sunflower seeds due to a nut allergy? I did and it worked great! Actually used a mixture of cashews and sunflower seeds. Yummy. Hi! We haven’t tried it but it could work! Let us know how it turns out! My husband and I made this tonight! The sauce is right on point. We will make again! Thanks for the recipe. Thank you for your continued inspiration and generosity! I love your creativity and recipes! What adobo sauce do you use? Hi Amanda! Any kind works! I made just the cauliflower and put it in a wrap with greens and refried beans. Delicious! Your recipes are so creative! Not sure I can chipotle peppers in adobo though, so may omit altogether when I attempt this. I don’t like cilantro because that is all I taste and my mouth doesn’t like really spicy stuff. What can I do when the recipe calls for that? I despise cilantro so just leave it out of recipes, but it’s not spicy at all. thank you! I was hoping I could just skip it! I have an almond allergy – what other nut would be good in the sauce? (I’m not allergic to any other nuts). Thank you!! Can’t wait to try this!!! Boy oh boy do those ever look good!! Taco Tuesday here I come! Is there any subsitute for the almonds that is nut-free? You could try something like sunflower seeds or hemp seeds? I used pepitas instead of almonds. Turmed out so delicious! This is going to be a staple in our house! I had the same question. I am gluten free and my son is allergic to peanuts and tree nuts. While we want to eat more vegetarian options, it is very hard finishing yummy things that the kids will eat and are safe for our allergies. Draw back or omit the chipotle pepper in adobo! hi, i’ve just made this dish with the sauce chilli and just one clove of raw garlic, it worked very well, lovely taste. Dana, thank you, your site is my favourite food site and has reignited by interest in cooking and food preparation. I have learnt so much, and I have enjoyed even more, thank you, thank you, thank you. haha, really!? But roasted cauliflower is SO good! Agreed! Roasted cauliflower is just Heaven!!! Really… I try everything in every way (so long it’s vegan) and have tried cauliflower from roasted to steamed to crumbled like couscous, as a pizza-base and even as a foam and… well, if I ever am to start a war (no plans) cauliflower will be the weapon of choice. I just tried this recipe and it’s BOMB!! Seriously so good!! Will definitely be doing this again with cauliflower! Trust her. I NEVER ate cauliflower before her recipes. These are amazing. Just made today for the second time since her original post. Cheers Sofia, and while I do trust Dana (frankly, 2 days ago I made way too much of her biscuits and gravy and savoured it somewhere alone while in hiding, they’re that good) I do not, shall not and will not trust cauliflower. LOVE Port Fonda! I can’t wait to try to make these yummy looking tacos! Made these for my newly vegetarian son and they were a huge success.